For Ahmed Osman, coming to the U.S. was like coming to a new world. Originally from Somalia where civil war has displaced hundreds of thousands of people, Osman arrived in snow-covered Minneapolis in March 2009. "It [was] a totally different country in every aspect of life," Osman said. Osman moved to Nashville, Tennessee, later that year, coming to a Southern city with a growing Somali refugee community where he knew a few people. While he could speak English, finding a job and fitting in to the community in Nashville was still a challenge. It took him six months to find a job, he said. Beyond the struggles of daily life, Osman, who is a Muslim immigrant, had come to a region where leaders and communities have become increasingly hostile to people like him. Since Osman arrived in Tennessee, lawmakers there and in other states across the South have introduced legislation targeting Islamic Sharia law, establishing English-only mandates and creating other barriers for immigrants. After the Paris terror attacks last November, antagonism towards refugees, particularly those from majority Muslim countries, flared. While Republican presidential nominee Donald Trump's anti-refugee rhetoric made headlines, Southern politicians have also stoked fears about refugees in the region. That backlash has in turn motivated refugees like Osman to speak out and — for those like him who are naturalized citizens — to vote in the upcoming election. "I hear a lot of comments from people [in my community] saying if Donald Trump is elected, he'll send us back," Osman said. "There is a fear created by his campaign. "That's why I'm focusing and everyone in my community is focusing this year," he said. 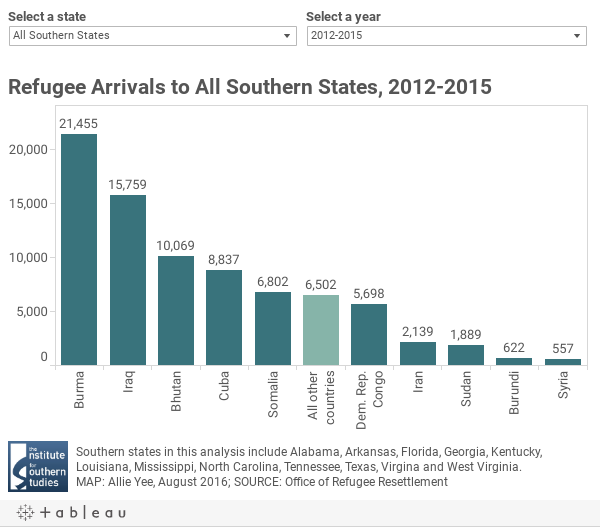 Each year since 2012, roughly 20,000 refugees have been resettled in the 13 Southern states, according a Facing South analysis of Office of Refugee Resettlement data. They make up about 30 percent of the new refugee arrivals to the country each year. While concerns about those fleeing war-torn Syria have been the focus recently, refugees from that country have made up only about 1 percent of recent arrivals in the South between 2012 and 2015. Almost half have come from Burma and Iraq, with significant numbers from Bhutan, Cuba, Somalia and the Democratic Republic of Congo. Before coming to the U.S., refugees go through a thorough vetting process that can take years and involves several international and U.S. federal agencies. The federal government partners with local agencies, including faith-based organizations like Catholic Charities of Tennessee and Church World Services in North Carolina, to resettle refugees in local communities. Each year since 2012, roughly 20,000 refugees have been resettled in the 13 Southern states. When Aline Ruhashya arrived in Greensboro, North Carolina, in 1998, she felt a mix of emotions. Originally from Rwanda, she fled the 1994 genocide in her home country, traveling to Congo, Kenya and Senegal before coming to the U.S. Initially, there was a "honeymoon phase," she said, when she was so excited to arrive and for all the promise of opportunity. But reality quickly set in. The apartment she lived in with her relatives lacked some basic needs, like pots to cook in. A teenager when she arrived, she struggled to understand her teachers and fit in at school. And with only three months of support from the resettlement agency, she worried about how her family would support itself when that time was up. "Those things kind of make you start wondering, am I going to be OK?" Ruhashya said. But there were also those who extended a helping hand to Ruhashya and her family, and this was another highlight of her experience coming to the U.S. It wasn't only the people with the refugee agency but also neighbors and teachers who helped her adjust to life in her new country. In 2005, Ruhashya became a U.S. citizen, as refugees are eligible to do after living in the country for five years, fulfilling her dream of becoming an American. The naturalization ceremony was an emotional experience for her. "Seeing all these people from different walks of life, different skin colors, different nationalities, becoming American citizens together," Ruhashya explained. "It's just like the foundation of this country." Overcoming the myriad of challenges involved in coming to a new country and building a new life, refugees and other immigrants contribute in important ways to their communities. A recent study by the Partnership for a New American Economy found that in North Carolina alone immigrants earned more than $19 billion in income and paid more than $5 billion in taxes. In 2014, they generated $972 million in business income and employed 120,800 people. But recent rhetoric has increasingly cast immigrants and refugees as drains on local economies and threats to safety. These portrayals have been heartbreaking to Ruhashya, who said people don't understand how hard it is to be a refugee and not have a country that you belong to. "It's not just about things like money," she said. "This person doesn't need anything. They just need a place to feel safe." While debate about them rages in politics and the media, refugees themselves have seldom had a voice in the conversation, noted Adamou Mohamed with Church World Services (CWS) in Greensboro. "Those that are being impacted by all of these negative sentiments that we've been seeing in the last year have not been involved much at the table speaking on their own behalf," said Mohamed, an immigrant from Niger. Mohamed is a grassroots organizer with CWS who promotes civic engagement among refugees, empowering them to have a greater say in decisions that affect their lives. With Mohamed's support, refugees have brought their concerns around issues like housing and jobs to their city council members, mayors, state legislators and even federal officials. ​Mohamed also encourages civic engagement through citizenship and voting. Becoming a citizen opens up new opportunities in terms of jobs and community involvement. Mohamed also emphasizes to refugees how important their right to vote is. "It's not something that was easily granted," Mohamed said, noting the sacrifices that people have made to ensure people of color and new Americans have the right to vote. Partnering with the local League of Women Voters chapters, CWS helped register over 300 new American voters at naturalization ceremonies in Greensboro last year, Mohamed said. Meanwhile in Nashville, Ahmed Osman is preparing to vote in his first presidential election. And he's determined to bring as many people from his community with him as he can. Seven years after moving to Nashville, Osman has built a life for himself. He knows many more people now, he understands how the system works, and he knows where to turn if he needs help, he said. In 2015, he became a citizen and voted in Nashville's local elections, which he said was a great experience. "You come to know that it's a really nice place," Osman said about his new hometown. "It's different today than the first time I was here. More welcoming today than that time." Osman has also become a leader and advocate for refugees and immigrants in Nashville, heading the Somali American Association of Nashville and sitting on the mayor's New American Advisory Council, which addresses immigrants' and refugees' concerns with local government. During the local elections last year, Osman helped organize voter turnout in his community. In Tennessee, nearly 38 percent of the immigrant population — over 114,000 people — were naturalized citizens and eligible to vote in that election, Stephanie Teatro of the Tennessee Immigrant and Refugee Rights Coalition told local media. This year, Osman is once again working to get them to the polls. "This one is personal to every one of us," Osman said. "Every vote counts, so I'll try my best."